In this post, I’ll show you how to configure Port Address Translation in which all internal hosts will share one external interface and IP address on the external network. Port Address Translation (PAT) is a many-to-one form of Network Address Translation (NAT). It is commonly found in home networks and small businesses where many internal nodes, using an RFC 1918 address space such as 192.168.0.0/24, share a single public IP address. Use the following diagram for this tutorial. Ensure that your workstation is configured according to the network diagram. On your router, identify which interface will be external and which will be internal. In a real-world setting, the inside interface would normally be an Ethernet connection to a LAN and the outside might be a T1 interface connected to a WAN such as the Internet. For the purpose of this exercise, the internal (inside) interface will be the Gigabit Ethernet 0/0 interface and the external (outside) interface will be the router’s Gigabit Ethernet 0/1 interface. You can also use sho ip nat translations and show ip nat statistics to view your NAT configuration. 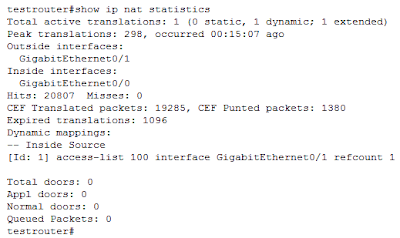 The output of show ip nat translations following a ping to a website. Inside local The actual IP address of an inside host. This is often an RFC 1918 address that is not routable on the public Internet. 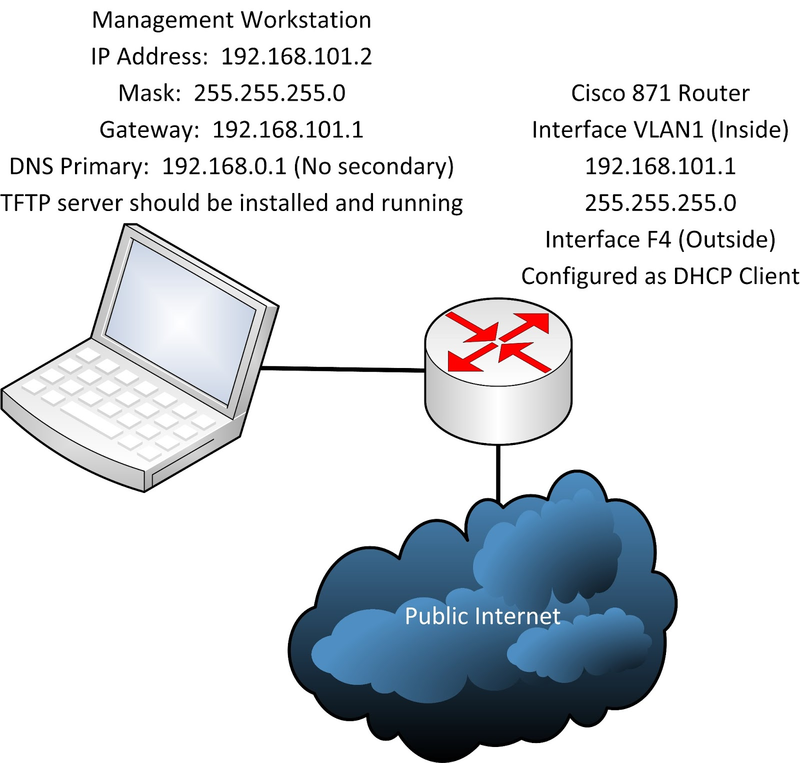 Outside local The IP address of an outside host as it appears to hosts on the inside network. This is how the inside host(s) see the outside host. Outside global The actual IP address of an outside host, usually assigned by its owner. 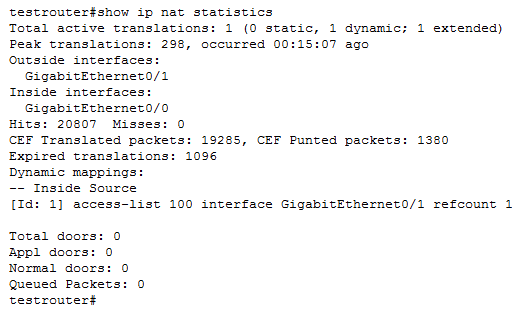 You can use the command show ip nat statistics to view various information about NAT's performance on your router. The output of the debug ip nat commands. In the above screen capture, you can see the time of the NAT translation, the source (s) and the destination (d). The intermediate IP address is the Inside Global address. The number in square brackets at the end of each line is the IP packet number which could be helpful in identifying the same packet in a protocol analyzer’s packet stream. For more information about configuring the Cisco router, please see my book The Accidental Administrator: Cisco Router Step-by-Step Configuration Guide, available through Amazon and other resellers or through the soundtraining.net bookstore. Also, consider attending my Cisco Router 101 workshop, either a public, open-enrollment workshop or available for onsite training at your location with your group. More information is available here. Don R. Crawley is a longtime geek and President/Chief Technologist of soundtraining.net with more than 35 years in workplace technology. He holds multiple technical certifications and is the author of numerous books on information systems and technology, including The Accidental Administrator: Cisco Router Configuration Guide. He has spoken to audiences worldwide on both technical topics and IT customer service. To view this Seattle IT pro's upcoming events or to receive free Cisco tutorials, Linux tutorials, IT customer service tips, and other guides, visit www.soundtraining.net or contact him at don@soundtraining.net or 206-988-5858.